Christmas is a special time of year for lots of reasons, the least of which is that it provides people with a legitimate reason to dig out the musical instruments that they haven't touched since middle school and play them at church. Not everyone who played in their 6th grade band, however, is eligible to play their instrument in such a hallowed venue. Based on my observations, only those who had the foresight to take up holy instruments are granted this special privilege. 1. Harp. The instrument of angels is always welcome in the house of the Lord. 2. Flute. This is the second most holy instrument, based simply on the fact that it is played almost exclusively by prepubescent girls. 3. Oboe. Despite connotations with Kenny G, this instrument still makes the list because it looks like a vertical flute. 1. Drums. Any instrument that is integral to a rock band is inherently unholy. 3. Trumpet, trombone, saxophone. Any instrument that is typically played by men, or makes sounds loud enough to drown out holy instruments such as the flute is always unholy. 1. Recorders. If you have a third grader, you know what I'm talking about. 2. People who were members of a show choir during college. GASP! That's no oboe that Kenny G is holding.. that's a soprano sax... the oboe is a much better and much more awesome instrument!! That picture of Kenny G is an unholy instrument of torture. And the recorder. Shoot me now! This has always bothered me! I would much rather listen to a well played trumpet than a poorly played violin any day. Kenny G plays soprano saxophone...not the oboe. Don't you just hate it when you mess up and everybody has to point it out? So, what you're saying is that you have former BYU Young Ambassadors in your congregation too? The grandchildren around here are partial to kazoos and tambourines--smuggled to church in their diapers. Nothing holy about that; I can tell you. Sigh. Why is Kenny G barefoot in his picture? Why? Kenny G looks so creepy. A few years ago, the musical number was performed on bagpipes. It was really good but really loud and probably would be considered an unholy instrument. Unfortunately, some Catholic churches have those unholy instruments, too LOL. I hate recorders. They should be unholy. Although not as bad as bagpipes. Kenny G plays soprano saxophone, not the oboe. When I was in high school, another youth and I played a duet of What Child is This on flute and guitar in church- it was actually really cool. 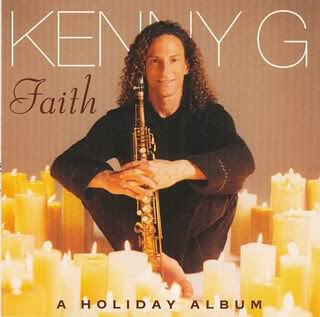 It mattereth not whether Kenny G plays the sax or oboe. His hair is unholy. A missionary couple in our ward just returned from a mission to Africa. During a musical number, the young man who played a medley of missionary songs on the piano broke out into a rendition of "The Lion Sleeps Tonight." Holy or Unholy? So your ward's Christmas program was torture, huh? If it makes you feel any better, the fact that I play the flute and the piano means that my mom calls me a couple weeks before I come home for Christmas and says, "so you're playing (insert musical instrument here) for Christmas Sunday when you get back. I'll show you the song when you get home." Oh. Okay. Thanks for volunteering me mom. i don't understand this post. i guess it's funny but what is it? an ad for kenny g's album? Yes, Kenny plays the soprano sax. I have seen that played in an LDS sacrament meeting. As a sax player I often am glad that I don't get that "honor" of playing in church. Agreed about the Recorder. That thing is hell on the ears and a mother's patience. Occasionally we are "treated" to hymns on guitar. There are reasons guitars play rock 'n roll. Ha. I played the french horn...it's pretty to look at. Does that count? The only problem is that I don't people want to hear "ummpah's" on such a holy day. Heehee. Whenever I think of an oboe I think of Peter and the Wolf. I had a professor in college who played every sax there was and played them incredibly well. Whenever he was new to a ward he said he'd approach the music chair and let them know he played saxophone. They would get uncomfortable and say thanks, but the bishop wouldn't approve, blah blah blah. He'd say something along the lines of, there's no instrument that can't make music the Lord would want to hear, there are only people who do that. From there on out he was often asked to play. And "Silent Night" played on guitar is one of my favorites. We had a couple singing and playing the guitar last Sunday and it was beautiful. Simple and sweet! I have a friend that gets paid several hundred dollars each Sunday to play drums in a S.Baptist Church. Could you imagine?!?! Unless you attend one of the wards in Salt Lake where several of the apostles attend, on Christmas they have a mini orchestra and perform part of the Messiah for their Christmas sacrament meeting- no joke. geez. in my book oboe=soprano sax. so there. Our bishop played the guitar in Sacrament Meeting last Sunday. I have to admit...it was the best part of the meeting. Last year one of the parents got everyone in my daughter's kindergarten class whistles. Who give kindergarteners whistles?? This year I was feeling especially evil and I almost bought every first grader in my daughters class recorders as a stocking stuffer. I didn't I was talked out of it but I might next year. As a harpist, I have always loved Garrison Keillor's "Young Lutheran's Guide to the Orchestra", in which he concludes that the timpani and the harp are the only appropriate orchestral instruments for a Lutheran. This post reminded me of that. That looks like Orlando harpist, Jan jennings. Link up to her site! Oh how I love this post. It is well known that one of my favorite things in life is a terrible musical number at church. To me, unholy is holy in this situation. I am a new person in singing.I think you want to say that those instrument which voice are getting from its originality are known as holy instruments.These instruments are helpful to understand the feelings of the people.What you say about my opinion? Mmmm. I play flute AND trombone (not at the same time). I don't see how the oboe--a wooden, double reed instrument--looks like a vertical flute. It looks more like a clarinet. Trumpets are usually considered somewhat holy..."Hark the Herald Angels Sing" and "Joy To The World"--the melody is usually trumpets. How can you have Little Drummer Boy without drums? I don't think recorders played by anyone under 21 can even be considered an instrument, especially if it was bought at Wal-Mart or the dollar store. As a mother of kids that play multiple unholy instruments (drums, saxophone, and electric guitar...they could at least form a band and make money), I agree, however the "members of a show choir during college" is just hysterically true! I nominated you for the Versatile Blogger Award. I live in Tampa and so relate to all your escapades as a new Floridian. You're one of my all time favorite bloggers. Happy New Year! Well, they are all music instruments meant to create symphony to lighten the heart of the world. So does it really matter whether they are holy or un holy? great! pls try check saversclub.us and you an start saving money through this. Too funny, but true! Some instruments just do something strange to your personal vibe especially when played wrong. lol A good inspiration for a future blog piece.